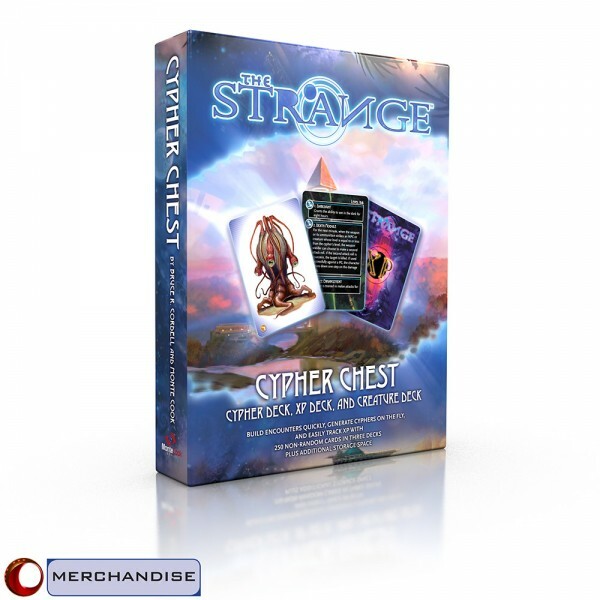 The Strange Cypher Deck, XP Deck, and Creature Deck are terrific game aids that make it easy to randomly determine and track transient items. The Strange Cypher Chest brings them all together in a single print product that gives you all three decks plus a great way to store them! The three decks come in a sturdy rigid box, sized to sit neatly alongside your The Strange books on your RPG shelves. The internal tray holds the three existing decks, with room to store future expansions. Cyphers are a great opportunity for characters to discover and use items from the Strange as one-time weapons, wearable devices, quick heals, and more. The Cypher Deck allows GMs and players to randomly generate single-use cyphers on the fly. Twenty item cards describe the physical form the cypher takes, depending on the laws of the recursion in which it appears, while each of the 100 power cards offers multiple power options to match the device. In The Strange, exploration and risk are everything. Players earn experience points not for killing monsters, but for making discoveries and facing unexpected challenges. You might rack up your XP between sessions, but most commonly you receive experience points during play, when events take an unexpected turn or you make a remarkable discovery. And XPs are a sort of currency, often changing hands between players. The XP Deck provides a set of tangible tokens to represent experience points. Build encounters quickly and easily, or create them randomly on the fly�then give your players a look at their foes before plunging into combat. The Creature Deck contains 99 of the most commonly encountered creatures from the shoals of Earth, drawn from both the corebook corebook and The Strange Bestiary. When you need to build an encounter (either when prepping your game or at the gaming table), simply draw a card from this deck. You�ve got basic stats (with a reference to the corebook, for full stats and info) on one side, and an image to share with your players on the reverse. On top of all that, you can easily store all three decks in the sturdy box, which is sized to fit nicely on your shelf alongside your other RPG products. And since one can never have too many cyphers or creatures, it even has additional space for future decks.